The goal of the Ikaros project is to develop an open infrastructure for system-level cognitive modelling. This includes system-level models of the brain, but also cognitive models that are not directly motivated by brain function. In addition, Ikaros will include databases of experimental data, computational models and functional brain data. The infrastructure supports a seamless transition from a pure modelling set-up to real-time control systems for robots running on one or several computers in single or multiple threads. The system makes heavy use of the emerging standards for Internet based information such as XML and makes all information collected accessible through an open web-based interface. We believe that this project has the potential to radically change the way system level modeling of the brain is performed in the future by defining standard benchmarks for brain models and substantially increase the gain from cooperative research between groups. A system like Ikaros can not operate in a vaccuum. Instead, the goal is to allow Ikaros to easily work with as many external sources of information as possible. There is simply too many types of information that need to be used by the system and without taking an inclusive approach the task of adapting information and models becomes too great. The only viable solution is to integrate Ikaros with other similar endeavors whenever possible. This inclusive approach means that we want to offer a large set of experimental data for use with Ikaros, but also making it very easy to adapt experimental data for use within the system. We are aiming for a real database framework with extensive ability to import data from public sources, but we also make sure that it is easy to adapt data for use with Ikaros directly. Inclusivness also means making development a transparent and straightforward process. As part of the standard infrastructure, Ikaros already contains a sizeable number of standard modules that are useful in a broad range of experiments. The infrastructure also contain modules that allow simulations to interface with various hardware such as video cameras and robots. For example, there are easy interfaces to the various standards for video capture. The goal of the infrastructure specification is to be minimally demanding for anyone developing a system module. It should be possible to learn to use it in a few minutes and it should be platform independent. This is absolutely necessary if anyone outside the project is to use the interface. An overall idea is to design a programming interface that is so easy to use that the easiest way to gain access to the experimental database is to use that interface. As a byproduct, this will make any model that uses the interface conform with the requirements of the model database. In the following sections we describe the different parts of the Ikaros system and the choices that have been made when designing the different components. The main focus will be on the simulation system since this is the part that is currently most developed. The core concept of system-level modeling is the module which corresponds to a part of a model. A module can have a number of inputs and outputs and encapsulates a particular algorithm. This does not mean that cognitive models built using Ikaros must adhere to a modular view of cognition. Instead, a system-level approach to cognitive modeling acknowledges that different cognitive components interact in many ways and it is one of the strengths of the approach that it explicitly shows these interactions as connections between modules. A module in Ikaros is thus not a statement about locality or impenetrability, it is only an acnowledgement that a system is constructed from several components, and these components or modules have different properties. What are the components of the system? This entails determining at what level the model should be described. Are the components individual neurons or brain regions, or are they some form of abstract description of functional components without direct relation to the brain? There is no single correct answer to these questions; it depends on the model being implemented. What are the relations between the components? Are they parallel systems with little interaction, or are they tightly coupled? Are they all at the same descriptive level or are some components subparts of others? Is the system heterogeneous or hierarchical? Which function is performed by each component? How can the functions be described as mathematical functions or as algorithms? Ikaros supports systems built from standard modules that implement elementary mathematical functions as well as modules that are hand coded from scratch. What information is transmitted between the components and how is it coded? The question of coding is the most important for a system-level model and the only one where Ikaros puts any major constraints on the possible models. In Ikaros, all inputs and outputs are coded as matrices of floats. This limits the possible models in several ways that makes it more likely that different models can be interconnected. Although Ikaros puts no constraints on the interpretation of the matrices, this type of structure is best used for coding in terms of numerical values, either directly or using some form of distributed code. In Ikaros, the components are specified using an XML-based language which also describes the relation between the components. The function in each component is described either using standard modules or by writing new simulation code. The transfer of information between components is implicit in the coding of the different modules. The figure below shows a simple module. This module has a single input through which it receives input data and a single output through which it sends its output data. The input is read in discrete time and the module also generates new output at discrete intervals. Figure 1. A module with one input and one output. Modules can be connected together to form systems. This network of modules is what makes up a model in Ikaros. In the fiygre below, the model consists of three modules A, B and C. Module A has one input (a) and two outputs (b and e). Module B has two inputs (c and f) and a single output (d). Finally, module C has one input (g) and one output (h). The complete model has the single input a and the single output d.
Figure 2. A small system with three modules A, B, C with connections between them. One of the great strengths of Ikaros is its ability to handle large complicated cognitive models consisting of many interacting subcomponents. To allow the specification of such architectures, an XML-based description language has been developed. Since the language is used to control the execution of Ikaros, the language uses the acronym IKC (IKaros Control file). This language has three main components: the module, the group and the connection. A module element describes an instance of a particular Ikaros module and sets its parameters. These parameters are handled to the constructor function of the module. The only two required attributes are class and name that decides what code the module will run and how it will be referred. Finally, it is possible to group modules and connection into larger structures. The following example corresponds to the structure shown in in the XML example below and Fig. 4. It defines a group (or new module) called X with an input x and an output y. The group consists of three modules A, B and C which have multiple connections between them. The input x is connected to the input a of module A and the output y receives data from output d of module B. <connection sourcemodule= "A" source = "b"
<connection sourcemodule= "A" source = "e"
<connection sourcemodule= "C" source = "h"
Figure 3. Example of a group of modules with its own input and output. The graphical representation of this system is shown in the figure above. Groups can also be given inputs and outputs to let them function as new modules or be read from external files and be used as call descriptions. A specification of these features is howeer beyond the current description. Currently, the main part of Ikaros is the simulation system which consists of a platform independent simulation kernel together with a large set of modules that implements different functions and models. There were a number of important considerations in the choice of the simulation structure. The first was that it should be platform independent. There are two reasons for this. The first is that it was expected that the system would be required to run on different architectures. The second, and more important reason was that the we did not want to depend on one particular compiler or operating system. Having once spent several years on a simulator in a discontinued dialect of object-Pascal had tought us that portability is something that has to be considered from the outset and it is well known that code is only portable once it has been ported. By simultaneously developing for several operating systems, it would be almost guaranteed that Ikaros would be reasonably portable. We have consequently strived to comply with the relevant standards as much as possible. These includes ANSI C++, POSIX and BSD sockets. A related choice was to depend on as few external libraries as possible. Although the current version of Ikaros uses external libraries for sockets, timing, threads and mathematical operations, it can still be run in a minimal version that only uses a small set of standard C++ libraries. The second main design choice was to use a discrete-time model for simulation. Although this is the normal operation for most neural network simulators, there are some notable exception. However, to allow the easy integration of different types of algorithms, it was decided that a discrete time simulator would be most useful. It is hard to imagine how many algorithms could be adapted to a continuous time framework. In most cases, this choice does not limit the possible models that can be designed since it only constrains the times when different modules communicate and not their internal structure. Another consideration was that to make the system attractive it should be as easy as possible to use many different types of programming styles. As a consequence, we decided to only use standard C data structures such as integers and matrices of floats. The use of doubles was decided against on grounds of efficiency and the lack of support for doubles in most vector co-processors. The point here is that this code looks like any C++ code and there is nothing Ikaros specific with it. When this function is called, the array input will contain the input to the module and after execution, Ikaros takes care of the result in the array output. It was also considered fundamental that simulations using Ikaros would not be slower than simulations made in a dedicated system. Conceptually, all modules in Ikaros run concurrently and synchronously. This mode of operation was selected because it is the only possibility when it is necessary that execution order is well defined, which is the case for many algorithms. Because of the synchronous operation, there will be a delay of exactly one time step (or tick) between the production of an output from a module and the time when it can be used by another module. In most cases, this extra copying step is necessary anyway and does not usually incur any extra execution cost. Since this overhead is not always desired however, version 0.8.0 introduced zero-delay connection between modules. Using this type of connections, there is no delay at all between the production of an output and its use by other modules. Instead, the second module refers directly to the memory where the first module has produced its output. To make the result well defined, zero-delay connections are only allowed within subsets of the complete module networks that form directed acyclical graphs. That this condition is fulfilled is checked during start-up when all modules are sorted according to their position in the graph. With zero-delay connections, the input to the system can in principle be processed in a single time step regardless of the number of modules that the information passes on its way to the output. In this case, the execution overhead is negligible. The kernel also includes a small set of libraries that hides system specific code for sockets, timing, threads and serial communication. In addition there are utility libraries for memory management, XML processing and mathematical functions. In most cases, the programmers need not know about any of these libraries to use Ikaros. 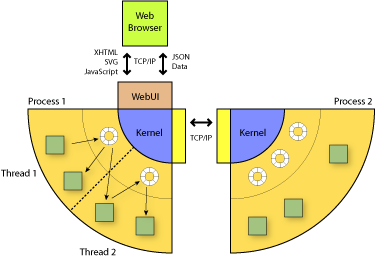 The kernel is responsible for the creation of the network and its modules at startup, the scheduling during system execution, and the propagation of data between modules. Fig. 4 shows the main component of the running Ikaros system. Detailed knowledge of the kernel operation is not at all necessary or even recommended for use of Ikaros. Knowing why and in what order things are started do however make it easier to understand the design decisions made. This section can be skimmed lightly without any loss of understanding. Figure 4. The Ikaros kernel. The kernel starts a number of threads where a number of modules (A-G) are executed. The modules communicates through a set of circular buffers that correspond to outputs from the modules. The kernel can also communicate with other Ikaros processes running on the same or on a different processor or computer. In addition, the kernel communicates with an optional graphical user interface client running in a web browser. Class Registration When the Ikaros program starts, it first registers all code for the modules contained in the system. This initialization step builds a data structure that contains pointers to a creator function for each module type and binds it to a module class name. The IKC files documenting each module is also read in this step. Module Creation When the initialization has finished, the kernel reads the supplied control file in XML-format, which specifies the modules to activate and gives them instance names and other parameters. One instance of each module specified is created for every occurrence of that module in the control file. A module can thus have multiple instantiations with different parameters. When each module is created, it registers its inputs and outputs in the kernel to allow them to be connected in the next step. At this stage, the individual modules also gain access to any additional parameters set in the control file for that particular module. Connections When all modules have been created, the kernel continues to read the control file and make the specified connections between modules. Size Calculations Most input and outputs have dynamical sizes that are set during start-up. For example, if the input of a module is connected to the output of another module that produces a 4x4 matrix, the input of the second module will adapt to this and set the size of its outputs accordingly. There can be any relation between the size of an input and the size of an output. For example, the output from the module could be set to have the double size of the input or some other more complex relation. Since there can be a number of cyclical relations between different modules, the calculation of output sizes is performed iteratively until all sizes have been established. If there are cyclical dependencies, these will be found during this stage and an error message will be produced. Sorting the Modules All modules are sorted in two ways (Fig. 5). The modules are partitioned into different sets that each contains a directed acyclical graphs (DAG) of modules with zero-delay connections between them and only delayed connections to any other modules. Each of these sets can be run in a separate thread and is called a thread group. A topological sort is performed on the groups according to their positions in the DAG which defines a partial order relation on the modules. For modules have zero-delay connections between them, this order is used to make sure that a module that produces data that another module will use is always executed before that other module. Figure 5. The order of execution of three modules. The numbers on the connections indicate the delay in the connections. The numbers on the modules indicate the order in which they should be executed. The two shaded areas correspond to two thread groups. Module Initialization When all modules have been connected, the initialization phase starts. At this stage, the size of the input that each module will receive is known and each module is allowed to create any additional storage that it needs and initialize variables. To do this, the kernel calls an initialization function for each of the created modules. The scheduling mechanism of the Ikaros kernel is responsible for calling the code of each module instance once during each discrete time step (or tick). In the simplest case, the scheduling consists of calling the tick function for each module in the order in which they were sorted during initialization. When Ikaros runs in threaded mode, each thread group is handled separately in this way instead. In threaded mode, there is no communication between modules in different DAGs during this time which greatly simplifies the operation of the kernel. In a second step, the data propagation function is called to copy data from outputs to the inputs of the modules. Data propagation is done simultaneously for all modules. The output for each module is copied to the input to which it is connected. The propagation process is also responsible for the simple data translation that is made by the system and concatenation in the case when several outputs are connected to the same input. In addition, this stage delays the data on connections when this is set in the connection. Finally, the kernel handles timing when Ikaros runs in real-time mode. In this case, the kernel makes sure that the execution of the tick did not take longer than allowed and waits for the appropriate moment to start the next tick. MyModule() The creator function registers all the inputs and outputs of a module. It also gains access to all parameters of this instance of the module from the control file. SetSizes() This optional function is called repeatedly during start-up to calculate the sizes of dynamic outputs based on the sizes if the inputs to the module. Init() The init function is called after kernel initialization and lets the module gain access to its inputs and outputs. This is also were any internal data structures are allocated. Tick() The tick function is where the actual work is being done by the module. It is called repeatedly during the execution of a module and should calculate new outputs based on its inputs. ~MyModule() This optional function deletes any module specific memory that has been allocated in Init() and performs other clean-up that may be necessary. Ikaros contains a large number of standard modules. These can be divided into a number of categories. IO Modules There is a set of modules that read data from different file formats, for example text data or different media files. Other modules are used to communicate with external devices such as cameras or robots. Utility Modules To simplify the design of models, there are also a large number of utility modules for simple mathematical operations. This includes vector and matrix operations and standard mathematical functions including polynomial functions. Other utility modules are used to collect data or statistics or to control an experiment. A few utility modules are used to generate input such as the function generator. Image Processing Modules Another set of modules implement standard image processing functions. There are modules to transform the colors in an image, modules that scale images in different ways or performs other spatial transforms. To apply different image processing operators there is a module for convolution, but also modules for specific operators such as the Sobel operator and parametrically defined Gabor filters. There are also several modules that performs edge detection. A few vision modules are more complex and implements a saliency map or an attention focusing mechanism. Environment Modules To allow simulation of an agent in an environment, there are a number of modules that implements simple environments. The GridWorld module implements a two-dimensional environment consisting of a grid with obstacles together with an agent that can navigate in it while being controlled by other Ikaros modules. There is also a variant where the agent can move continuously over the grid. This module also simulates a 2D visual field using a ray casting algorithm. More environment modules will be added in the future. For example, we are currently working on a simulation of an arm. Other Modules The standard module also include a few neural network algorithms and some general learning algorithms. When Ikaros is used to control robots it is necessary that the precise timing of input and output can be controlled. To accomplish this the kernel has functions to time the execution of each tick. When Ikaros starts up it sets its time-base to the required interval and tries to time the ticks to this time-base. It internally controls that it is able to keep up with the desired speed and will report delays in the execution. Obviously, the accuracy of the timing will depend on the underlying operating system. Since Ikaros is currently not running on real-time operating systems, any other process can in principle interfere with real-time execution. However, in practice, it is possible to get less than 1 ms resolution on Max OS X and probably similar performance on other operating systems. An important factor that contributes to real-time performance is the ability to run Ikaros in multi-threaded mode which is made possible by the Ikaros thread library that is built on top op pthreads and adhers to POSIX.4. In this mode, the kernel tries to run every module in a separate thread. When there are zero-delay connections between a set of modules, the kernel will automatically put these in the same thread. In thread mode, each module can be set to run at different time intervals, For example, a slow visual processing module may run 5 times per second while a faster motor control module can be allowed to run 100 times per second. This feature is very useful for robotic control where some loops need to run at high speed while others are much heavier. One limitation of this solution is that it is not as fast as using a dedicated program for the client and very far from using a graphical subsystem included in Ikaros. However, we felt that this solution has several advantages. First of all, it means the whole system becomes totally platform independent. But also, and perhaps more importantly, it enables us to transparently monitor and control a running simulation remotely, independent of what system the simulator and the client is running, and we can do so with a simulation running in another room or across two continents with no loss of functionality. If fast, concurrent representation is important, the very open-ended structure of an Ikaros module enables users to simply write a graphical module that includes the toolkit or other representational system of their choice and display data sent to the module from there. Likewise, a module that receives user interaction can change the behavior of other modules in the system accordingly by defining a "command channel" that sends data to other modules via the same mechanism as ordinary data. Ikaros does not care how data is interpreted within modules after all. This information could be used to match the graph made up of the modules in an Ikaros model to connectivity data found in neurobiological databases. Some first attempts towards such as system have been taken. In our earlier studies of classical conditioning we have developed an extensive database of the design and results of conditioning experiments. The development of this database started in 1996 and now contains approximately 200 different experiments. The database is stored in a way that allows the experimental descriptions to be used as input to computer simulations of learning by classical conditioning. Unfortunately, this database was initially stored in a form that is not easy to access unless an earlier simulator is used. It also has the limitation that it only covers classical conditioning and not other learning paradigms. As a part of the Ikaros project, we want to extend the experiment database by adding more experiment types and by translating the database to a more accessible format. In the future, we will add experiment description for other learning paradigms besides classical conditioning. This includes operant conditioning experiment as well as more cognitively oriented experiments. The goal is to cover all experiment types that are regularly used with animals and humans. The entry for each experiment will include all information that is necessary to reproduce the experimental conditions in a simulator or a real experiment. This includes detailed data of the stimuli used, the apparatus, the exact timing etc. It will be important to differentiate between the part of the experiment description that contains the logic of the experiment and features such as timing and spatial location that are often not essential. This will allow modelers to adapt experiments to their needs in much the same way that an experiment developed for one species has to be changed to fit another. The database will also contain experiment descriptions in narrative form and pointers to external publication databases. To allow easy access to the experiment database, it will be coded in the XML format that is widely used for on-line data. The choice of XML for the database is natural since it allows for an evolving and continually expanding database structure. It can also be used to mediate the transfer of information from other already existing databases. Apart from translating the already existing database to this format, we will also develop tools that can be used to encode and visualize experiments through a web-based interface. During the last five years, Ikaros has been used to build a number of computational models. Its first use was in models of emotional processing in the brain. It has also been used in several models of cognitive development and developmental disorders. Ikaros has also been used in a series of models of haptic perception and in a model of the somatosensory cortex. One of the aims of the system was to be able to build large-scale models of visual processing and a few results have already been published. Ikaros has also been used to model the role of context in learning and for robot control. We would like to thank all the people that have tested and commented on the system during its development, in particular Takashi Omori, Håkan Jonson, Kolbjörn Gripne, Magnus Johnsson, Chris Prince, Martin Butz, Stefan Karlsson, Stefan Winberg, Anders Karlström, Mikael Asker, Vin Thorsteinsdottir, Sigurbirna Haflidadottir, Kiril Kiryazov, Gianguglielmo Calvi.